The engine is undoubtedly the heart of your vehicle with hundreds of moving parts that require proper maintenance and lubrication time to time. While the engine runs on gasoline, it also takes in air from the outside. For every gallon of gasoline consumed, dust and dirt are brought in with the air that comes with the gasoline. And dirt contaminates the engine and is one of the biggest causes of engine failure. Know one thing; your engine gets dirty really fast which can degrade performance of your vehicle. While most of the dirt gets cleared, some dirt may still get by the air filter. This may lead to sludge formation at different parts of the engine which together with dirt and wear particles may result in engine failure. This is where the engine oil comes to the picture. Engine oil is the thing that keeps your engine running day after day. It only lubricates the engine parts but also filters out contaminates and keeps the internal components clean. The main function of engine oil is to lubricate as hundreds of moving parts in the engine rub continuously against each other which creates friction which in turns reduce the engine longevity. Engine oil comes in different categories such as 5w30 and 10w30, along with many others. Although the function of the lubrication system has not changed much, engine oil has changed drastically over the years. 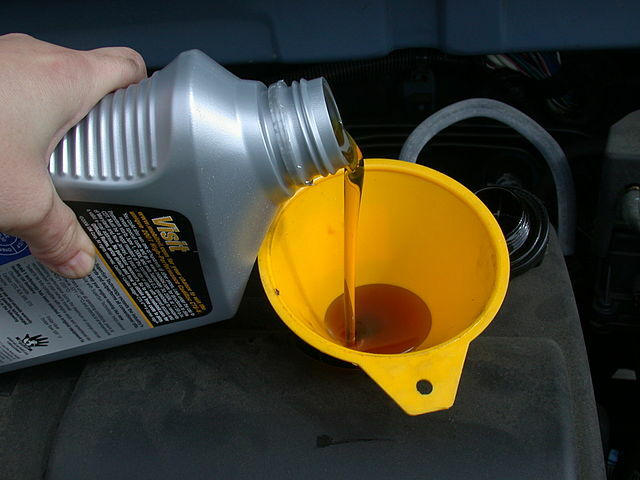 One most important factor that affects the engine oil performance is viscosity. SAE (Society of Automotive Engineers) rates engine oil viscosity. Two of the most common viscosity ratings are 5w30 and 10w30. Engine oils with these ratings are called multi-grade oils. It is a multi-grade viscosity engine oil used in automobiles. It’s one of the common viscosity ratings as specified by the Society of Automotive Engineers (SAE) to keep the engine running at a wide range of temperatures. The numbers refers to the viscosity of the oil and the ‘w’ stands for winter. The number 5 is the cold-temperature viscosity rating and the 30 is the high-temperature viscosity rating. They are thing enough to flow effectively at low temperatures meaning the oil will thicken less in cold climates to provide adequate engine lubrication. It is also a multi-grade engine oil mostly used in vehicles with heavy-load engines because it’s able to withstand hot temperatures for a long period of time without compromising engine performance. 10w30 will flow effectively at high temperatures and it’s one of the most common oil grades recommended for commercial vehicles with older engines because they require a thicker oil for proper engine lubrication and engine longevity. The larger the first number, the thicker it gets when the engine is hot and the more resistant to flow effectively. 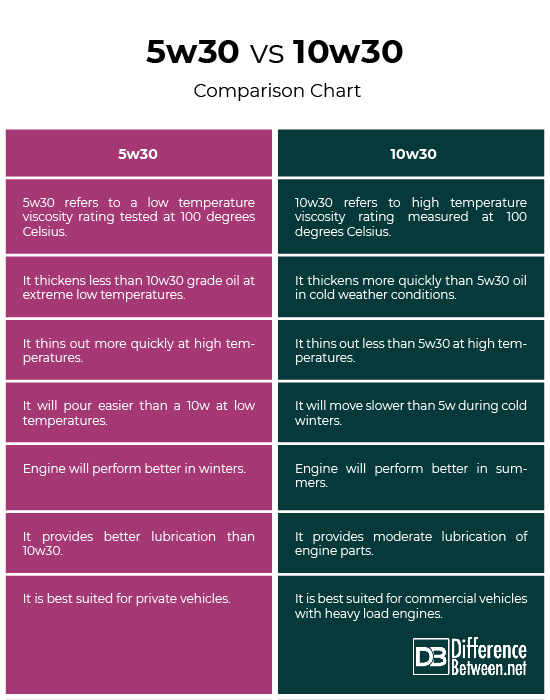 Both the ratings 5w30 and 10w30 represent the viscosity of the engine oil as specified by the Society of Automotive Engineers (SAE). The numbers in both the ratings refers to the viscosity of the oil and the ‘W’ stands for winter. Both are multi-grade oils which have been tested at various temperatures to ensure low temperature operability and better fuel economy. Both the oils have lower viscosity at temperatures which measure the oil’s resistance to flow. The difference lies in the thickness. The lower the first number, the thinner the oil gets at extreme low temperatures. 5w30 is a SAE 5 when cold and SAE 30 when warm. Same goes for 10w30 multi-grade oil. Both the SAE ratings have same base number meaning both the engine oils will perform the same at operating temperatures. The number 30 indicates the thickness of the oil when it reaches operating temperatures. Both the oils have similar viscosity at 100 degrees Celsius but 5w30 grade oil will thicken less than 10w30 grade oil in cold climate. This means 5w30 grade oil will flow effectively in low temperatures, whereas 10w30 oil will flow effectively in high temperatures because of the smaller temperature window. 5w30 oil gets thin enough when cold to provide adequate engine lubrication. Location is a key factor when it comes to selecting engine oils because it’s equally important to factor in the location where you’ll be using your vehicle. Although multi-grade oils are designed to perform effectively in both warm and winter climates, 5w30 grade oil will be thin enough when you live in a location with extreme low temperatures so that the oil gets to all of the components, making your vehicle perform better in during winter times. On the contrary, 10w30 will flow effectively in high temperature locations or hot summers. If you live in a location where the temperature stays low year round, then 5w30 is your best option as it performs better in cold climate and moves better during cold startups. 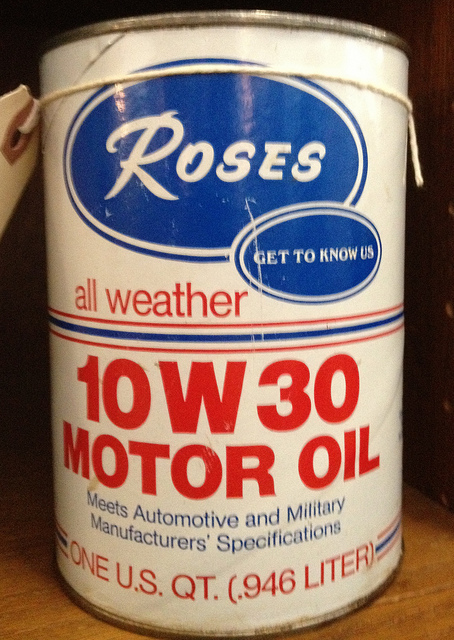 On the other hand, if you live in an area where the temperature is consistently high year round, you’ll want to go with the 10w30 oil because it allows oil to flow more rapidly and lubricate parts effectively to enhance engine wear. Light oil is ideal for cold climates whereas heavier oils perform better in warm climates. The oil should be thin enough to get to all of the components when the engine is cold, but the oil should not be too thin when the engine is hot. Sagar Khillar. "Difference Between 5w30 and 10w30." DifferenceBetween.net. August 9, 2018 < http://www.differencebetween.net/object/difference-between-5w30-and-10w30/ >.